← Three Cheers for the Spartan! Dogs like to have fun. And camping is fun. So if it’s not too hot or cold, I say skip the kennel and take Spot along for some outdoorsy fun. Here are some reasons why. First, dogs are good bear repellent. 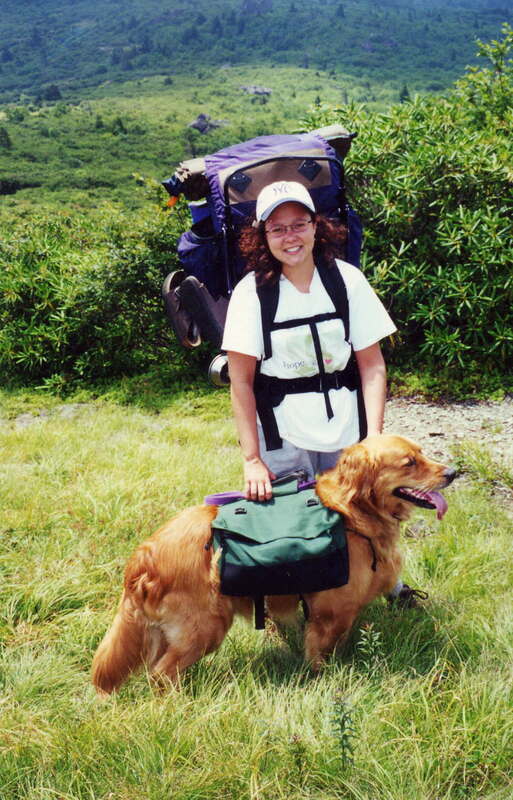 My canine friend Bacchus accompanied us on a short Appalachian Trail backpacking trip several years ago. He liked to run ahead, and we like to think he was warding off bears. Here’s Bach in his doggy backpack on the Trail. Also, if you’re camping in anything that can be broken into with a can opener, it’s a good idea to have some extra protection. 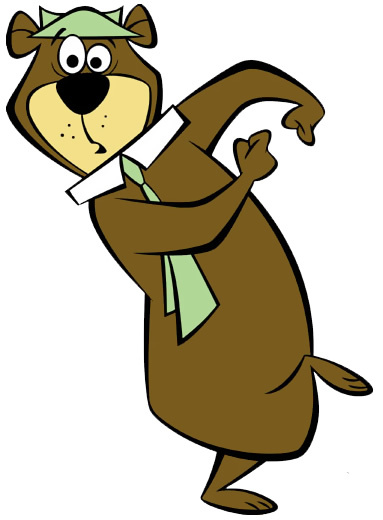 And like bears, most bandits will stay away from a mean bark. Cody has a loud and scary bark. I hope he likes camping. I haven’t taken him on any recent trips because they’ve involved canoeing, and I think he’d freak in a boat. I know he’d freak if I left him back at the campground by himself while I was on the river. But what’s cozier than sitting around a campfire with your four-legged best friend? I imagine Cody would love sacking out by the fire after a long day of hiking or playing in the river. So I’m hoping that he’ll find a camper as comfy as I do. 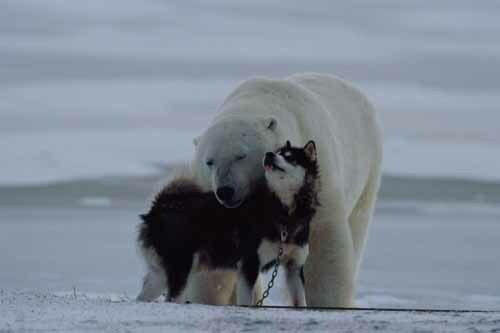 "Scared of dogs theory" doesn't apply to polar bears. By the way, camping dogs, I get. But camping cats? I know some people who camp with cats, but I can’t see how that would be fun for anyone involved (I know a sad story involving a family I canoe with, but I can’t bear to write it). 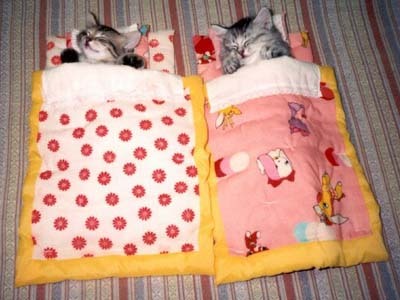 Cats are better off camping out on the couch. 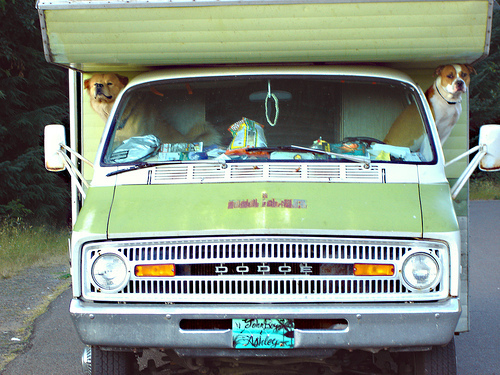 This entry was posted in Getting Started and tagged camping with dogs. Bookmark the permalink. Bacchus did love to camp!! He carried his own food and our hotdogs in his doggy pack too! But, he hated canine hiking booties! Bach had a bear bell that he wore that was supposed to alert bears that people were around; and he slept so well after a long day on the trail. Miss that dog! Cody will love hiking/camping no doubt!! That bear bell was awesome!